Analysis of fragile seagrass meadows by Cardiff University and Swansea University scientists has shown that consistent pollution from sewage and livestock waste is affecting their survival. 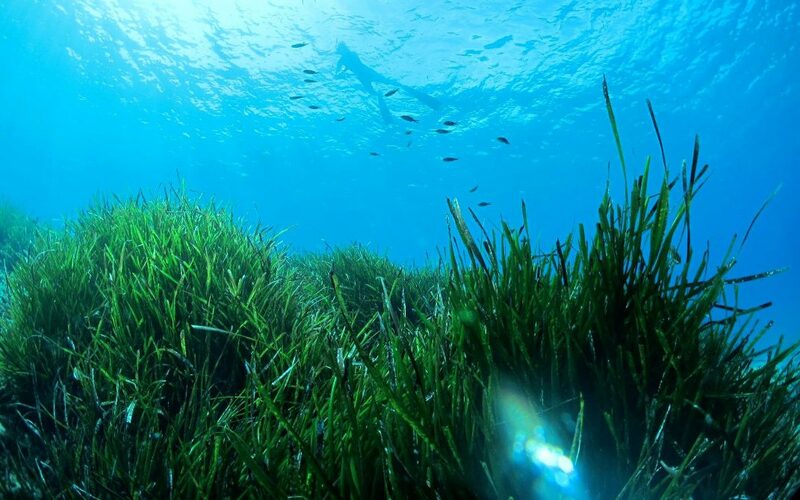 Seagrass meadows are flowering plants that have adapted to live a life in the sea and were recently featured in the BBC’s Blue Planet II episode ‘Green Seas’. They have been called the “canaries of the sea”, due to their sensitivity to a changing environment. Like the canary in the coal mine, their condition can be used as an indicator of the condition of our coastal areas. Persistently high pollution puts the long-term resilience of seagrass meadows in doubt. Previous work provided evidence that nutrient pollution is a constant feature across the British Isles, but these new findings give the clearest indication yet of the source. Leaf tissue was analysed for nitrogen and a stable isotope of nitrogen called 15N. The abundance of 15N is greater in sewage and livestock waste than in other sources, so these results offer a unique insight into where the nitrogen in seagrass originates from. Ten of the 11 sites within this study were in areas with designated EU marine protection. Despite being safeguarded under the EU Habitats Directive and some meadows being designated Special Areas of Conservation, most of the seagrass meadows included in the study were in poor condition, with nitrogen levels 75% higher than global averages. The seagrass meadow with the highest levels of nitrogen from sewage was found within the Thames waterway. However, a seagrass meadow in Studland Bay, Dorset, popular with swimmers and boaters was also significantly enriched with nutrients from sewage. Despite high levels of sewage nutrients being detected, none of the locations were classed as unsuitable for swimmers. The open access paper Tracking nitrogen source using δ15N reveals human and agricultural drivers of seagrass degradation across the British Isles is published in the journal Frontiers in Plant Science. This article was originally published by Cardiff University on 13/02/2018.